The 16srRNA gene from cultured isolates from the squid accessory nidamental gland was amplified using PCR and sent out for sequencing. Results from the 8 initial isolates came back, allowing us to identify the different genera of bacteria associated with the squid. The amplified 16srRNA gene that was amplified was almost the entire length of the gene allowing for a reliable identification of each bacterial isolate. The two different primers (8F, 1514R) utilized caused replication from different sides of the DNA strand. From the two independent sequencing reactions, a contiguous DNA sequence was aligned with CodonCode Aligner. We performed a Standard Nucleotide BLAST (NCBI) in attempt to find closely related bacteria and other invertebrates that might be associated. 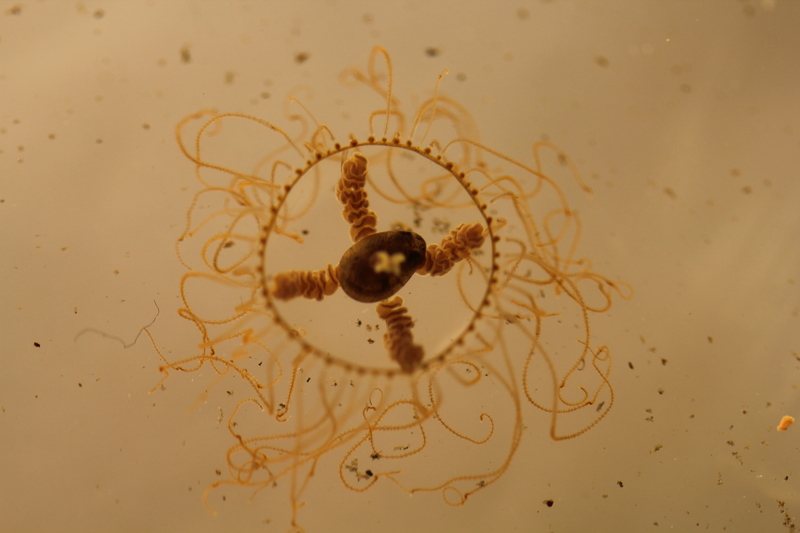 These basic molecular and microbiological techniques were applied to an unsuspected discovery of invasive Clinging Jellyfish, Gonionemus vertens, that were discovered in July during research in the Long Island Sound. I have isolated 31 different bacterial colonies derived from a single cling jellyfish specimen. We have gone through the process of isolating several samples, amplifying the 16srRNA gene as well as characterizing the basic bacterial morphology. 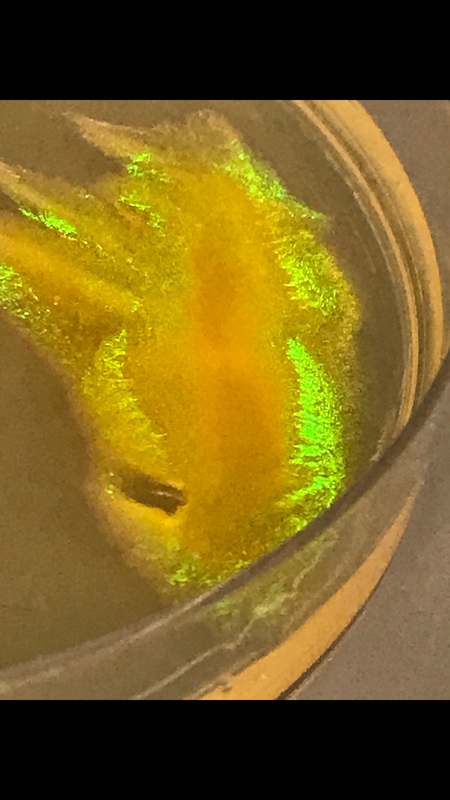 The process of isolating these Clinging Jellyfish bacterial isolates revealed a number of colonies that had a green or orange iridescence. We are interested in identifying these novel bacteria and would like to discover the role of this iridescent bacteria with this jellyfish. After the 16srRNA gene is amplified, cleaned up and sequenced, they will be sent out for sequencing. 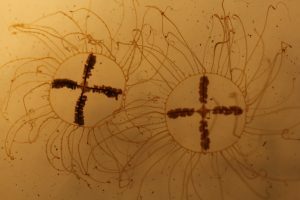 From there, we will once again be able to further classify and explore the different type of bacteria that are associated with the Clinging jellyfish. The title of our experiment is Characterization of the Microbial Community of the Accessory Nidamental Gland of the Longfin inshore squid, Loligo pealei. The research that is being undertaken is focusing in on the symbiotic relationship that is present between marine organisms and the mutualistically beneficial bacteria that grows on these organisms. The foundation of this research was interest in the nidamental gland of the female reproductive organ in squids. 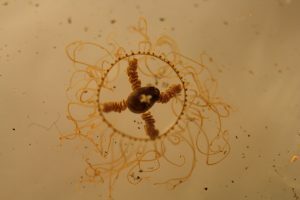 The nidamental gland is responsible for coating the eggs with a jelly like substance that is integrated with bacteria to serve as a protective barrier against predators and fowling. If this bacteria is able to be characterized, The properties that allows it to protect the eggs will be understood and potentially be beneficial in other ways. Understanding this bacteria will be attempted through 16S rRNA gene sequencing. Results will assist in understanding of marine symbiotic organisms and how they function. 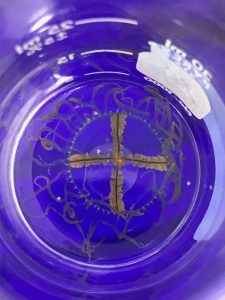 This will be the first study addressing the microbial population of the Longfin inshore Squid nidamental gland as well as their egg cases. So far, many efforts have been made in reference to lab training for the experimentation itself. 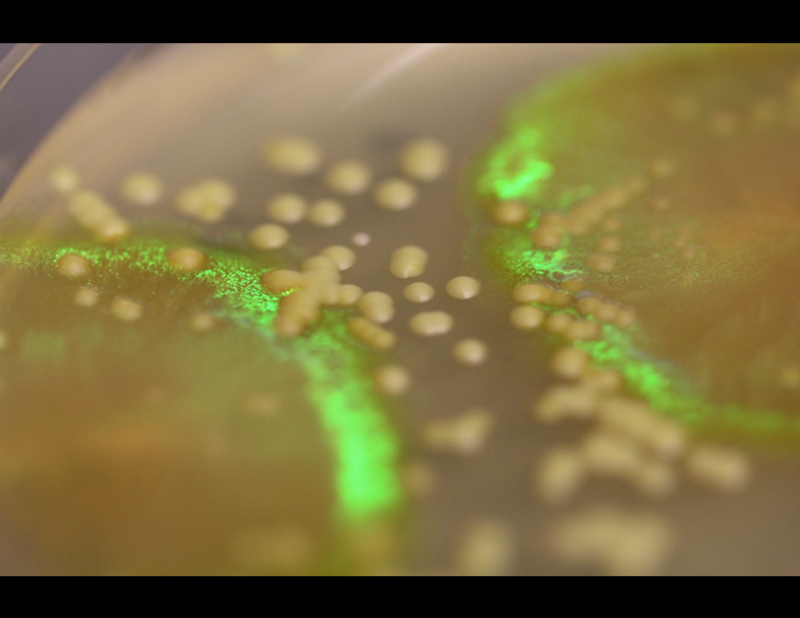 LBS agar plates were created in order to perform 3 way streaks and isolate particular bacteria from the marine symbionts. Squid, as well as jellyfish that were collected through wading, were the subjects of bacteria isolation. 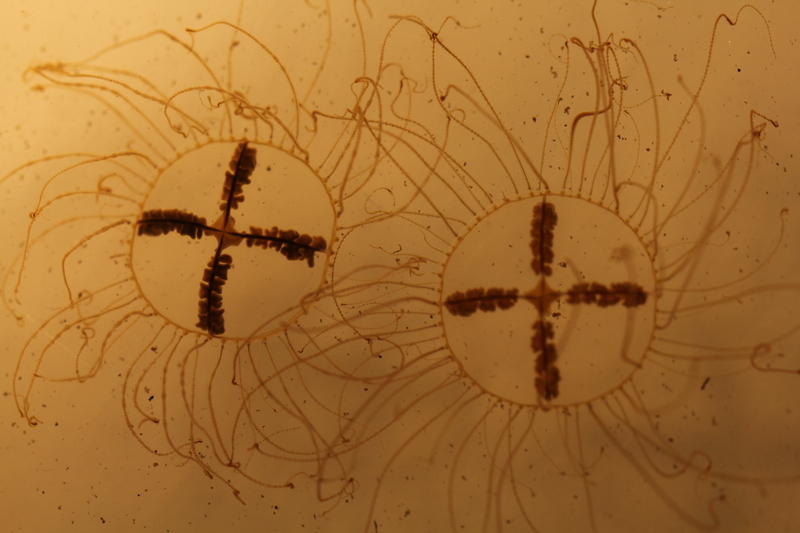 The process of isolating the bacteria from the jellyfish was extensive, beginning with euthanization of the jellyfish (through freezing), macerating it, rinsing it with 3x deionized water and then vortexing it. Through performing a three way streak of this sample, particular colonies of bacteria were able to be isolated and examined individually. Colony PCR was performed following this and the samples were then inserted into gel in order to perform gel electrophoresis. PCR clean up was then undertaken using a Qiagen kit. This is done in order to prepare the DNA samples that were amplified to be sequenced. Twelve different bacteria samples were successfully amplified through PCR and able to be sequenced in the lab so further characterization of the bacterial colonies can occur in the future.